More than 800 units top-end variants of the facelifted Maruti Suzuki Ciaz have been called in for an instrument cluster swap. 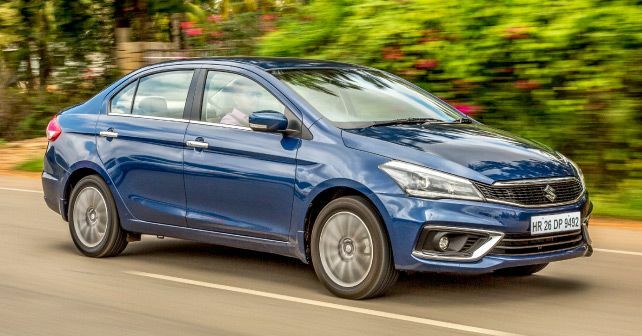 Maruti Suzuki has called in the 2018 Ciaz to check and replace the speedometer. The company will also replace the owner’s manual for the cars as well at the same time. Only the Zeta and Alpha variants of the Ciaz face-lift will need to be addressed in regard to this initiative. All units of the C-segment sedan manufactured from 1st August to 21st September are part by this initiative. More than 880 cars made during this time will need to be checked. The Manesar-based car maker has assured its customers that the current speedometer doesn’t pose any safety concern. Replacement of the speedo, as well as the manual, will be free of cost for customers. Maruti Suzuki has created a new page on their website where customers can check of their Ciaz is part of the recall. Maruti Suzuki brought in the updated Ciaz earlier this year in August. Since then the sedan offering has been bringing good numbers for the brand. Just like before, even this face-lifted model is economical, practical and superb value for money. Apart from the visual changes to the design, Maruti Suzuki introduced a new 1.5-litre petrol motor in the Ciaz. This motor makes 103bhp and 138Nm. While the new petrol made its debut in the Ciaz, it is expected to be plonked in the new Ertiga too. Maruti is all set to bring in the new Ertiga later this month. Bookings for the MPV have already begun. Click here for more information on the new 2019 Maruti Suzuki Ertiga.